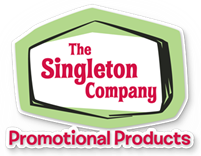 Artwork Specifications – The Singleton Co.
Must be saved in the Postscript™ Format and contain no Postscript errors, stray points or colors assigned inconsistently to the supplier’s published requirements (Note: Due to the wide range of native software packages, please check with your supplier to determine the best format for delivery of your vector files). All type that has been set must be converted to outlines (curves). If future changes to the text will be necessary, the original font file must be supplied with the art file for use on the supplier’s specified computer platform (Mac or PC). All design elements in the file must meet the supplier’s published minimums for line thickness. Failure to do so may compromise the final imprint quality. If the vector file contains any linked (placed) raster images, these images must meet the supplier’s minimum requirement for resolution when rendered at 100% actual imprint size and must be submitted with the original vector file. Note: Raster files may or may not be accepted by the factory. All raster images must meet or exceed the supplier’s published minimum resolution(pixels-per-inch) when rendered at the actual imprint size. All raster elements must be submitted in the proper color space (RGB or CMYK) as published by the supplier. Note: some page layout files may or may not be accepted by the factory. Page layout documents must be prepared to render the artwork and all of its elements at 100% of the actual imprint size. In addition to submitting the page layout documents, all vector and/or raster files that are referenced by the page layout document must also be included. Include any fonts that were used in the production of the page layout document for use on the supplier’s specified computer platform (Mac or PC). Note: Many suppliers choose not to accept page layout documents. Please check with your supplier to see what software and versions are preferred. PDF files that contain raster elements must meet the minimum requirements for raster art files as outlined by the supplier. PDF files containing vector elements must meet the minimum requirements for vector art as outlined by the supplier. PDF files created from page layout documents should be submitted together with the source documents, fonts and all supporting files. Only professional software packages may be used to produce artwork. Although programs like Microsoft® Word and Publisher are useful tools, they are not capable of producing art files of a quality necessary for imprinting purposes.